The Thomas Crown Chronicles: Czar's Sample Post of the Week: "Big Pimpin'"
As I mentioned in my "Put you on the game" lawsuit post HERE, someone recently reopened a copyright infringement lawsuit against Jay-Z, Timbo, and a slew of others, over the "Big Pimpin'" sample. Well, a federal judge in California ruled this week that the plaintiff, Osama Ahmed Fahmy, has standing to pursue the lawsuit. If my memory is right, this is the third lawsuit filed against Jay, Tim, et al, over "Big Pimpin'." While the other two cases were dismissed, this lawsuit might have some merit. 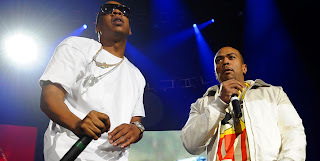 Essentially, Fahmy is claiming that while Timbaland and Jay-Z did not violate the "economic rights" through sampling "Koshara" for "Big Pimpin'", he's using Egyptian copyright law to say that they violated the "moral rights" of the original composer of the track. You can read about the past lawsuits HERE (shout out to Big-A) and HERE (shout out to Wayne), a short and simple break down of the case HERE, and the full court documents HERE. I haven't read the documents, but when I do, I will give an update of my thoughts on the lawsuit. Only time will tell if Timbaland will beat this case again, or if his luck will run out. What do y'all think about this? Let us know! So heres one, where does the giggle sample in My Love come from?? ?